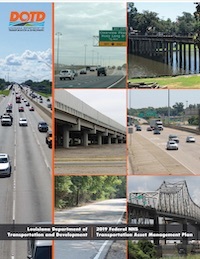 The Louisiana DOTD TAMP is available here. The Louisiana DOTD TAMP presents how the state proposes to allocate limited funding resources to bridge and pavement management needs. It provides an overview of the state's TAM principles and tools, existing guiding documents, and current inventory and conditions of pavement and bridges. It then presents performance scenarios, life cycle planning, risk management strategies, and the state's financial plan, as well as investment strategies and proposed asset management enhancements. This document includes the following sections: Asset Valuation, Current Methods and Tools, Data Management, Financial Plan, Future Demand, Introduction, Inventory and Condition, Investment Strategies, Lifecycle Management, Objectives and Measures, Performance Assessment, Process Improvements, Regulatory and Legislative Requirements, Risk Management.